Announcement I've moved to LucyDesignsArt.com Creating contemporary mosaic art. I'm no longer creating mermaids, dragonflies or angel wings! I've moved to LucyDesignsArt.com Creating contemporary mosaic art. I LOVE this winged art. I have these note cards and have thoroughly enjoyed them--so much so, that I gifted a set to my Niece. She was delighted! They are very special and are now at an amazing clearance price! 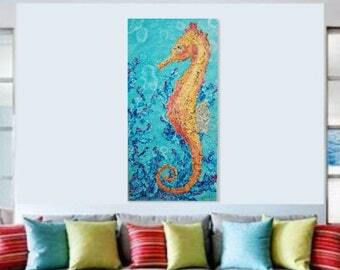 Colorful seahorse just added to the shop, great beachy vibe! Hello! I'm Lucy, happily married wife, mom, painter and mosaic artist living in Panama City Beach here on Florida's beautiful Gulf Coast. I've been creating and painting professionally for the past 20 years selling my pieces locally here on the Gulf Coast and 30A area. In 2012, I opened my online shop doors on Etsy and it has been truly wonderful and given me the opportunity to ship my art all over the world. I create in my home studio and love exploring texture, colors and patterns to bring the ideas in my head to life. All of my items are created, painted, boxed and shipped by me. I truly love what I do and I'm so grateful to be able share my creativity and art with everyone. I live and work from my home studio on the beautiful Gulf Coast of Florida with my wonderful husband and two cats. Visit my new website dedicated to mosaics. www.LucyDesignsArt.com Thank you! Thank you so much for visiting my shop, enjoy! Except in very limited circumstances, my items are not eligible for return. However, I want you to be delighted with your order! In the rare event that an order has to be returned, return postage/shipping is the customer's responsibility and will not be reimbursed. **Florida sales tax of 6% plus .5% local infrastructure tax + .5% school capital outlay surtax is added at checkout for Florida purchases. **Panama City Beach Florida business license tax of 1% applies to all states and is added at checkout. **If you would like to pay by money order, I accept USPS Money Orders only. The majority of my shipping is done with Fedex although smaller items could be shipped with USPS. For larger items shipped Fedex, I will not choose a signature required upon delivery unless you request me to do so. If your order were to arrive damaged from shipping, please save the box and all packing materials and contact me right away so I can work to get it resolved. Sending detailed photos of the damage to the item and box/packing materials with your message will expedite the process. If you are in the Panama City Beach, Florida area, you are welcome to pick your order up from my home studio and save on shipping costs. Outside the US? I haven't added international rates within the listings but I've shipped to many places around the world. Convo me for rates. Some countries impose custom duties or VAT fees on incoming packages, these are responsibility of the buyer. In an effort to keep all order information and correspondence in one place, I prefer using Etsy conversation/messages for order communication, thanks! How can I order a spindle/table leg dragonfly?